As of April 2017, there are a handful of financial products in the Travel.Write.Money wallet. The wallet is composed of state and work identification, credit cards, bank debit card, and health insurance card. I will go into more detail on the contents. With respect to identification and health insurance, those seem rather self-explanatory. One must carry a driving license and work identification daily as a condition of driving on public streets and having a job. It is a good idea to carry your health insurance card so it is handy when you need it. One thing I did not mention was cash. It is rarely necessary to carry cash. While I am a fan of cash for the privacy of transactions, it is a rare instance that requires cash in my daily life. In addition, cash does not have reward points, which is a nice segue for credit cards. 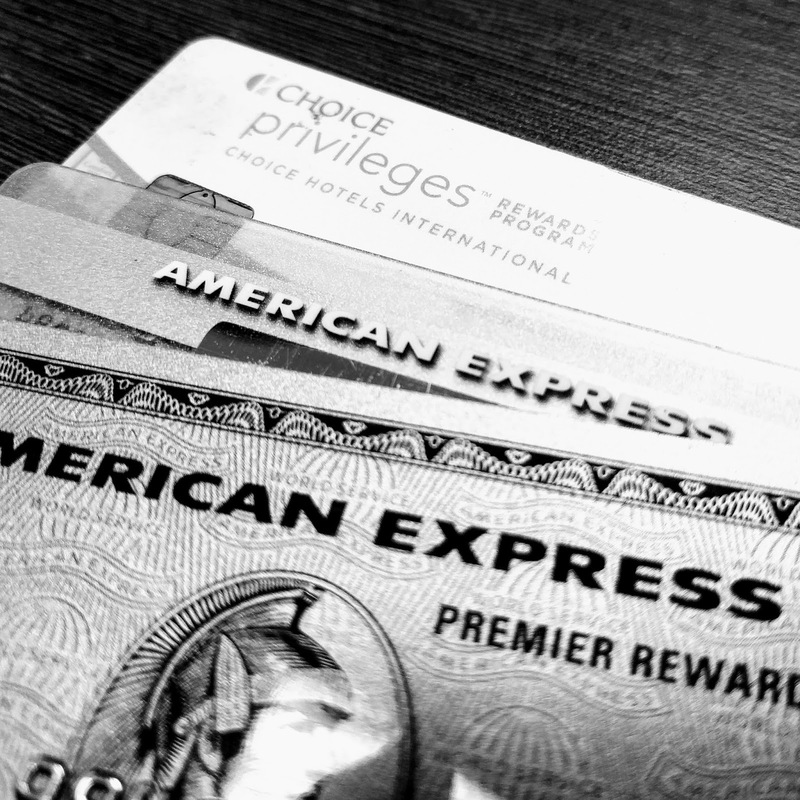 I currently carry four credit cards in my wallet: AMEX Premier Rewards Gold, AMEX Everyday Preferred, Choice Privileges Visa, and First Progress Platinum MasterCard. The First Progress Platinum Mastercard only has a $300 limit; it is a secured credit card. I used it to restart a credit history after many years of no credit cards and no bank accounts. I initially got the card because renting a car can be problematic with debit cards. I also needed a credit card to buffer for everyday expenses. If you go around swiping your debit card for all your purchases, it's a matter of time before some joker steals your info and empties your cash account. So, I had to frequently make payments to the card as a result of the $300 limit. This card will never increase my limit unless I deposit more money. I originally kept this card after getting the AMEX Everyday Card just in case a vendor did not accept AMEX. I mainly keep this card because it is the oldest credit account I have. It will be some time before I can cancel without a significant ding to my credit report. Speaking of vendors who do not accept AMEX, I now have the Choice Privileges Visa card, which is on standby for non-AMEX vendors. This situation does not happen too frequently. Therefore, I typically use the card for weekend staycations at a local Cambria Hotel for points and to pay my electric bill, which does not take AMEX. Choice Privileges has been very handy for travel. The hotels in their portfolio are more my budget. Given the low-cost stays, it is cheaper to earn free nights. My first American Express card was the Everyday Card, which adds a 20% points bonus after making 20 purchases with it. This was great at the time until I realized that I had made a mistake. I was hesitant to pay the annual fee for the Everyday Preferred card when I first signed up. And, being my first time with a points card, I did not think I could rack up many points and would struggle to make the 20 purchases to qualify for the bonus. After a few months with the Everyday Card, I decided that I would be better served with the Everyday Preferred Card instead. Not only was it easy to hit 30 transactions in a month, getting 50% points bonus every month was much better than 20%. I applied and was quickly approved. So, I am transitioning to this card. 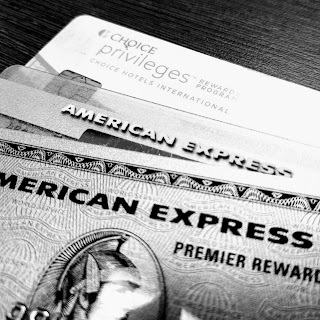 I have not decided whether to cancel the regular AMEX Everyday card or not. There is no annual fee; but, I am not really using it as intended either. In terms of bonus points, the Everyday Preferred Card best fits my lifestyle of paying bills, buying groceries, and pumping gas. Thus, I am able to maximize points with this card. Finally, I have the most recent addition, the AMEX Premier Rewards Gold card. I got the Premier Rewards Gold card as an eventual segue to the AMEX Platinum, which my wife and I will use when we spend a few months traveling. The PRG (Premier Rewards Gold) card gives better points in some instances than the Everyday Preferred. The spending strategy is to use the Everyday Preferred (EP) for groceries, gas, and monthly bills. The PRG card will go towards travel, gas, and dining. At only one point per dollar, it is not worth using for non-category shopping. That same dollar can get me 1.5 points on the EP. Things I can't buy with AMEX go on the Choice Privileges Visa, in addition to Choice Hotel stays. If I need to stay at a non-Choice Hotel, then I'll go through PRG. And, nowhere else does the First Progress Platinum card fit in. I really should cancel it. The debit card I use is for my Simple.com account. I typically only use the card for cash withdrawals. It rarely sees the light of day. And that is my wallet.